My sister recently came to visit with her kids. She usually stays at my parents’ house, but since my dad has put it on the market, we decided it was best that they stayed with me. My relationship with my sister is something I treasure. She is my friend, my therapist, my superego. We realize how fortunate we are. Not everyone has a sister, or one they like so much. While we have different personalities, we look and sound very much alike. I’m an extrovert, she’s an introvert. I drink Diet Pepsi, she drinks Diet Coke. My hair is curlier. She’s taller. I’m a party girl, she’s a jock. It’s an odd phenomenon for people to think we’re twins when we are not. I once asked a stranger outside a movie theater if he could recommend a restaurant in the area. He said, “Is your name Judith?” He had gone to high school with my sister, who is four years younger than me and has lived out of state for many years. It’s a little unsettling to freak someone out by your mere appearance. But it’s also kind of cool – it’s our little party trick. Having a sister as your bestie has many benefits. We have the same frame of reference from being raised in the same house by the same people. We know all of each other’s friends, who become our friends too. We are the head of each other’s advisory boards. No subject is too big or too small to be discussed – we cover the gamut – marital squabbles, parenting concerns, the merits of the HPV vaccine, SAT versus ACT and how to make chicken schnitzel. Neither of us is much into fashion but we are our mother’s daughters so we try to put ourselves together. After our mother died three weeks before my nephew’s bar mitzvah last year I had to return a beautiful suit she had bought for the occasion. Our mother was petite and we are not, so neither of us could wear it. We joked that our mother would have looked better than both of us, which she usually did. We didn’t mind. We felt proud to have such a beautiful, stylish mother even if we sometimes felt like her frumpy daughters. I often went with my mother to her medical appointments. Once, as we waited to be seen by the doctor, we sat across from each other in the exam room. “I don’t like that jacket,” my mother said. “Really? I got it at Target. What don’t you like about it?” I asked, somewhat amused. “I don’t like the color or the fabric,” she casually explained. I went home and promptly called my sister with this breaking news. Mother was generally right about these things. Like our mother, we are both practical and like our father, we are direct. We’re comfortable with who we are and generally say what’s on our mind. We enjoy being with other people but equally enjoy being by ourselves. We each lived alone when we were single. We loved the solitude, quiet, and autonomy. When I showed my kids where I used to live before I met their dad one of them asked me who I lived with. I told him I lived alone. He thought that was sad. I relayed this story to my sister. Life has occasionally tossed me lemons, but not in the sister department. This entry was posted in Family and tagged Family, mother, sisters. Bookmark the permalink. This story reminded me so much of Marin and Emlyn. Your mom must have been so happy to watch you two together. There is no better feeling in the world…. I smiled all through reading this. I am just about to visit my younger sister for the weekend and, oh! I an excited! Last weekend I tried begging off our scheduled video chat. My husband urged me to keep of. Afterward, I had to admit he was right. I always feel better after talking to my sister. There’s so much that’s understood without needing to be said. 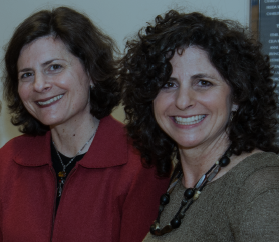 Susan, Having just visited with you and Judith, the blog captures the “sisterhood” between you two perfectly. I’m here in my house alone on this rainy day, and I just laughed out loud because it was so “spot on” and funny. You’re mom certainly did have an exquisite sense of style. While the guru of style, I am sure she always knew you and Judith would take her advice in stride and with good humor. I love the Sisters Margolis!!!!!!!!!!!!!!! Love!! Just about spit laughing at the living alone comment. So very Judith, but you could have said it as well. Are you sure you aren’t twins? Love the post..made me think of my great sisters! One of the things I love best about reading your blog is reading your dad’s comments. You are blessed. Love this! And love you and Judith, together and separately.